The Philips Norelco Shaver 8100 (1250X/40) (also called the Series 8000) is, according to Philips, their most advanced shaver and it’s packed full of technology that should provide an exceptionally smooth shave. To find out if that’s true, we’ll take an in depth look at its features and performance in our detailed Philips Norelco Shaver 8100 (1250X/40) SensoTouch 3D review. Wrapup — Who should buy the Shaver 8100 (1250X/40)? Gyroflex 3D — this is Philips Norelco’s name for the contour-following capabilities of some of its shavers. 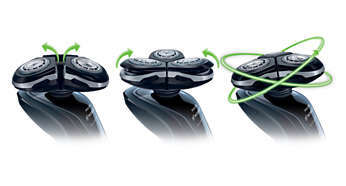 The three rotary heads can flex outward and inward independently, while the whole shaving unit can pivot. This combination allows it to adapt to every surface that is being shaved, like that tricky jawline, chin, and neck. Even though it sounds a bit gimmicky, it is one of the most effective systems that claim to adapt to all the different areas and significantly improve the shaving experience. Ultratrack — refers to the actual design of the shaving heads: they have slots for normal hair, channels for long, flat-lying hair and holes for short stubble. Super Lift & Cut: — we’ve seen this technology on other Philips shavers that we previously reviewed. 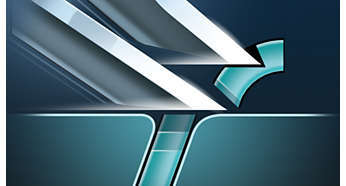 There is a pair of two blades designed to cut the hair bellow surface level: the first one lifts the hair and the second one does the actual cutting. Skin Glide — the rounded edges and flat surfaces of the cutting block are very skin friendly and should minimize the friction and irritation when shaving. Other features worth mentioning are the quick charge option, wet & dry operation, a precision trimmer for some light grooming, 3 level battery indicator, travel lock, LED display, cleaning and replace shaving heads indicators. The Norelco 1250x/40 looks and feels like a premium product. Even though it has an all plastic body (with rubber insertions in certain key areas for added grip), it has a sturdy construction and a glossy black finishing that’s easy on the eye. The weight and balance are also just right; the handle has an ergonomic design that allows for both a precision and a power grip. The Philips Norelco shaver 8100 is fitted with a travel lock that can be activated by simply pressing and holding the power button for a few seconds. I am not particularly fond of the 3 level battery indicator as it’s not particularly useful. Overall, the build quality and ergonomics of the Shaver 8100 (1250X/40) are really good. The Series 8000 comes with a Li-ion battery that can be fully charged in one hour and provides 50 minutes of shaving time. The charging cord plugs into the stand and the shaver can only be charged in this manner. You can easily see the drawback of this approach as you’ll always have to carry the stand with you when traveling. It would have been better if the cord could be plugged directly into the shaver, like in the case of the Braun 7 Series. It is no deal breaker, but it would have been a thoughtful move by Philips. The use of a charging stand should be a convenience and an option. The razor features a 3 level battery indicator, battery low indicator and a charge indicator. In practice, the battery life is solid and will easily provide the claimed 50 minutes worth of shaving time. Since the 1250X/40 is a wet/dry model, it can only be used cordless. If you’re only going to use it dry, cleaning the Shaver 8100 should be very straightforward. The easiest way to clean it is to simply hold the razor head under running tap water. For a more thorough cleaning, each of the three shaving heads should be removed and rinsed under hot water. The cutters and combs should be cleaned thoroughly with warm tap water. This operation means opening the retainers and removing the cutters from the combs. It is best to only clean one shaving head at a time while following the instructions from the user manual that comes with the shaver. You do not want to mix them up as the cutters and combs are matching pairs. After that, you can just shake off the excess water and leave the shaving heads open to fully dry. This cleaning routine should be carried out after every use if you shave with gel or cream. 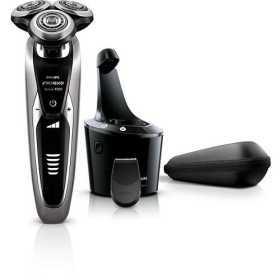 The SensoTouch 3D line is marketed by Philips as their best shave to date. And the 1250x/40 (Series 8000) is without a doubt one of the more capable rotary razors out there. You’ll have a hard time finding one that is noticeably better in any aspect — maybe the new S9000 Prestige. The closeness of the shave is about as good as it gets for a rotary shaver. In my opinion a quality foil shaver will still provide a closer shave for most users, but if you’re a rotary type of man I think you’ll be quite pleased with the Norelco 1250x/40. One of the most impressive aspects about the way it performs is just how effortlessly fast it shaves. Due to the large surface that comes into contact with your skin, the rounded edges of the cutting block and the excellent contour-following design, it just mows through any type of stubble without any discomfort. It is without a doubt one of the fastest rotary shavers out there. It is also impressively quiet during operation. The Shaver 8100 is also really effective at catching longer, flat-lying hairs. So if you shave less often, it could be an excellent option. Another thing worth mentioning is that the Series 8000 is a versatile shaver that can be an excellent choice for men that shave their head. It can cover large surfaces fast and adapts easily to the spherical shape of the head. The ergonomic design of the body allows you to easily maneuver the shaver regardless of the area that’s being shaved. As for the negatives, I don’t find the Philips 1250x/40 to be the most comfortable razor out there. To me, the double edge design of the rotary blades causes this constant stinging sensation that can be a deal-breaker if you have sensitive skin. Then again, I do have this gripe with most rotary shavers and it may not be an issue for other users. Overall the shaving experience is excellent, worthy of a high-end rotary razor. The replacement part for this shaver and the other ones in the SensoTouch 3D family used to be the RQ12 replacement head and it has become very expensive. That part is now discontinued and replaced by a new updated version, called Philips Norelco RQ12/62 Replacement Head for Series 8000. The new part has an improved design of the slots and even though it is still a bit expensive compared to the parts from other manufacturers, it is significantly cheaper than the old one. Philips recommends replacing the head every 12 months and has equipped the razor with an indicator that flashes when the part needs to be changed. The SensoTouch 3D 1250X/40 doesn’t disappoint in any major areas if we refer strictly to shaving performance. If you’re after a rotary razor that is powerful, extremely fast and capable of delivering close and comfortable shaves you should really check this one out if it fits within your budget. As far as rotary shavers go, it is definitely one of the best. Men in search of a shaver for their head should consider this one as well. As you probably already know, the Series 8000 doesn’t come with a cleaning and charging station. Given the fact that this razor requires some thorough cleaning every once in a while (and it’s not on the cheap side), a cleaning station would have been nice to have. The good news is that you can buy it with a Jet Clean System that cleans, lubricates, dries and charges the shaver under the name Philips Norelco 1250x/42 SensoTouch 3D. The actual razors are identical. I generally avoid cleaning stations as I don’t consider them particularly necessary — especially for foil shavers that are very easy to clean. In this case however I would actually consider it as the price difference is not that high and manually cleaning a rotary shaver can take some time. However, the 1250X/40 and 1250X/42 have been discontinued and it’s very unlikely to find them nowadays. Therefore, you should consider other similar Philips Norelco models. 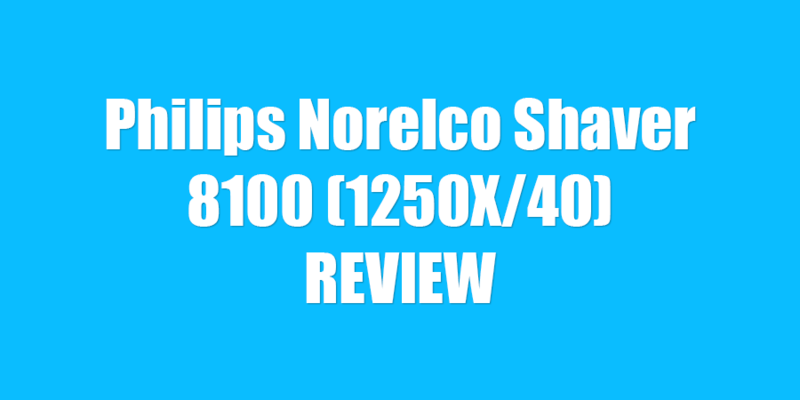 The best option is probably the Philips Norelco 9300 from the Series 9000. The performance is very similar, it’s widely available and it comes with an excellent cleaning station.